George Wythe Randolph (March 10, 1818 – April 3, 1867) was a lawyer, planter, and Confederate general. He served for eight months in 1862 as the Confederate States Secretary of War during the American Civil War. He reformed procurement, wrote the conscription law, and strengthened western defenses. He was President Thomas Jefferson's youngest grandson by his daughter Martha Jefferson Randolph. Randolph was born in 1818 at Monticello near Charlottesville, Virginia, to Martha Jefferson Randolph, the daughter of U.S. President Thomas Jefferson, and her husband Thomas Mann Randolph, Jr., a descendant of Pocahontas through his father. Their youngest son, he was named in honor of George Wythe, a signer of the Declaration of Independence and law professor of his grandfather Thomas Jefferson. He was also related to the seventh governor of Virginia, Edmund Randolph, who served in George Washington's cabinet as the first Attorney General of the United States, as well as 3 times 3rd great-grandfather colonist William Randolph, through Isham Randolph of Dungeness, Richard Randolph and Thomas Randolph of Tuckahoe. Randolph briefly attended preparatory schools in Cambridge, Massachusetts and Washington, DC, where his mother sent him to give him distance from family troubles. His father had incurred much debt. Randolph served as a midshipman in the United States Navy from 1831 to 1839 and began attending the University of Virginia while in the service. On April 10, 1852, he married the young widow Mary Elizabeth (Adams) Pope (1830–1867). They had no children. After studying at the University of Virginia, Randolph "read the law" with an established firm; he was admitted to the bar in 1840. He practiced law in Charlottesville, Virginia, and he and Mary lived at his plantation of Edgehill. They moved to the capital of Richmond in 1849. He became active in the community as well as having his law practice. He founded the Richmond Mechanics' Institute and was an officer in the Virginia Historical Society. As the Confederacy formed after southern states' secession, the United States divided into two hostile camps and the sections moved toward open conflict. A special delegation, composed of Randolph, William B. Preston and Alexander H.H. Stuart, traveled to Washington, D.C. where they met President Abraham Lincoln on April 12, 1861. Finding the President firm in his resolve to hold the Federal forts in the South, the three men returned to Richmond on April 15. George W. Randolph depicted on an 1863 Confederate $100 banknote (with Lucy Pickens). Randolph was commissioned a major in the Confederate Army, and later served as a colonel of the artillery in the Battle of Big Bethel. He was promoted to brigadier general on February 12, 1862. His wife Mary Randolph was active in the Richmond Ladies Association, which organized welfare and relief for the war effort. Randolph was appointed by Jefferson Davis as Secretary of War on March 18, 1862, and he took office on March 24, 1862. He helped reform the department, improving procurement and writing a conscription law similar to one he had created for Virginia. He was most well known for his strengthening the Confederacy's western and southern defenses, but came into conflict with Jefferson Davis over this. With weakening health due to tuberculosis (TB), he resigned on November 17, 1862. In 1864, Randolph took his family to exile in Europe, staying in England and France. They returned to Virginia in 1866. He died of tuberculosis in April 3, 1867 at his Edgehill plantation. He is buried at Monticello in the Jefferson family graveyard. 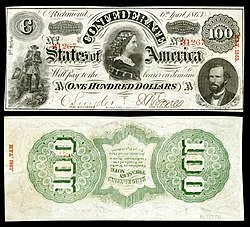 Randolph was portrayed on the $100 bill printed by the Confederate States of America. Goldberg, David E. "George Wythe Randolph (1818–1867). ", Encyclopedia Virginia, Ed. Brendan Wolfe. 6 Apr. 2011. Virginia Foundation for the Humanities, accessed 6 April 2011. Moore, Richard Channing. Genealogy of the Page Family in Virginia. Daniels, Jonathan. The Randolphs of Virginia: America's Foremost Family, Garden City, New York: Doubleday, 1972. Janney, Caroline E. Burying the Dead but Not the Past: Ladies' Memorial Associations and the Lost Cause, Chapel Hill: University of North Carolina Press, 2008. Shackelford, George. George Wythe Randolph and the Confederate Elite, Athens, Georgia and London: University of Georgia Press, 1988. "George W. Randolph". Find a Grave. Retrieved 2008-02-13. This page was last edited on 23 August 2018, at 22:40 (UTC).